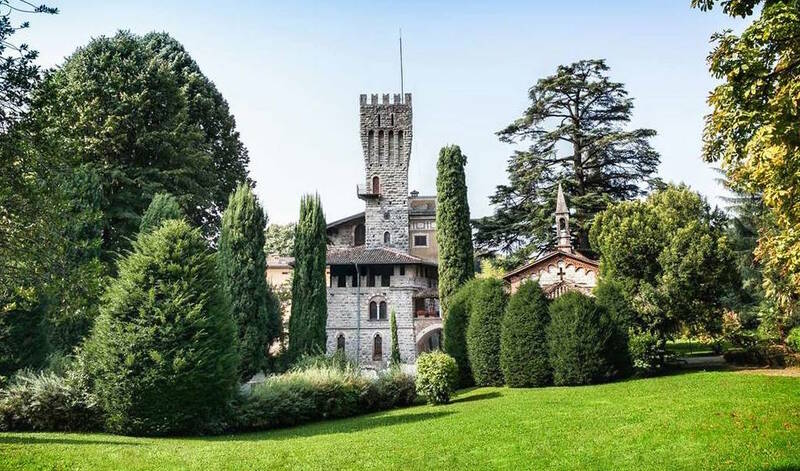 Count Suardi’s Villa that once was the heart of the hamlet “Navale” along with the farm houses preserves its ancient splendour and represents one of the most beautiful and refined historic residences of Val Cavallina, near Bergamo. Of course the cycle of frescos has great impact on the prestige of the Villa. They illustrate St. Barbara’s and St. Brigid’s stories through a clever complex of sacred, exoteric and alchemical references. Thanks to such important artistic heritage and its long and charming history, Villa Suardi surely represents the ideal location to turn your wedding into a dream set into the chest of memory. The crenelated tower, the spectacular park inhabited by centuries-old trees, the beautiful rooms with frescos, the elegant veranda adorned with soft and white drapery, the small wooden bridge dedicated to Romeo and Juliet. Anything in Villa Suardi is a sweet and evocative love symphony. The wonderful view on the park lets the bride and the groom remember the best day of their lives as a romantic and poetic dream. Their guests can discover the innumerable secret corners of this historic residence, full of charm, art and magic. The splendid court in front of the building is the ideal setting for the welcome aperitif, while the veranda, lit by luminous wires, could be the perfect location for a refined banquet. And for the wedding-cake cutting you can go outside again: the fragrant magnolias, the bunches of optical fibres and the trembling candles brushed by the breeze. Everything is supervised by Longhi Banqueting’s staff, which professionally and meticulously take care of any detail in order to organise an exclusive, unforgettable and unique event that will surprise anyone. Villa Suardi has successfully passed the 100 Quality Controls established by the "Certification Protocol of Historic Houses of Excellence" and is properly certified by the ITALIAN REGISTRY OF THE HISTORIC HOUSES OF EXCELLENCE. The phone number of Villa Suardi is +39 035958966. The fax number is 035959551.